All who wound God's works, wound God's image. Kabbalah and Ecology: God's Image in the More-Than-Human World is a radically new vision of Judaism deeply anchored in the most traditional sources. It has been called "exhilarating" (Bill McKibben), "crucial and irreplaceable" (Rabbi Jill Hammer), "a tour-de-force" (Rabbi Yitz Greenberg and Mary Evelyn Tucker), and "one of the boldest, most imaginative and theologically significant works to appear in recent memory" (Rabbi Nehemia Polen); it "jumps off the page with relevance" (Jeremy Benstein). Order the paperback from Amazon ($33 plus shipping) or abebooks ($32 plus shipping; sometimes as low as $26), or from Cambridge (currently $26 with discount code "Seidenberg"). Read/download a PDF of the Introduction here. You can also read the endorsements for Kabbalah and Ecology here. Read Methods for Jewish Constructive Theology. Methods was written as an appendix to Kabbalah and Ecology. 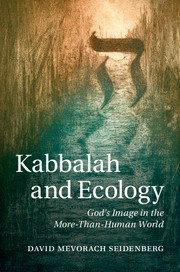 Click here to browse Kabbalah and Ecology on Googlebooks. Get the text study sheets from the Parliament of World Religions by clicking here. Join neohasid's list to get updates about the website, the book, discounts, and more. You can also join the Facebook group for KAE or for neohasid.org.